We don’t like red alerts in SCCM monitoring nodes especially related critical site Component status. We can reset the SCCM site status message count on any component or site system to remove the red alerts from console. I won’t recommend the reset of SCCM component or site system summarizer counter. Instead, you need to check and understand why there is a critical alert in SCCM site status summarizer. Why to Reset SCCM Site status Summarizer counter? What is the SCCM Site Component Status Summarizer? What are the options to reconfigure SCCM Site & Component Status Summarizers? As mentioned above, I don’t recommend to reset site or component status summarizer counter before fixing the actual issue. If you have critical site status then, fix the issue before resetting the counter. SCCM/ConfigMgr site and component status message counts are automatically reset at the end of threshold periods. As part of troubleshooting, we may need to reset the counters to confirm whether everything is ok or not. SCCM Status Summarizer helps admins to determine the health, or status, of different aspects of SCCM/ConfigMgr CB Infrastructure. The SCCM site and components status summarizers are getting input from status messages, states, and counts. There are four (4) status summarizers in the current branch version of SCCM. 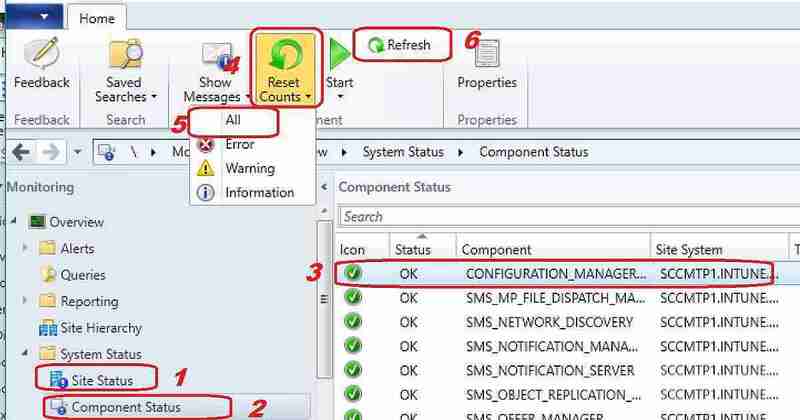 You can read more information about these components in the following post SCCM Site Component Status Summarizers Troubleshoot Issues. Navigate via \Administration\Overview \Site Configuration\Sites – click on the status summarizer ribbon button. Application Statistics Summarizer is specify how often application statistic should be updated. Intervals are based upon the date the application is last modified. To change the configuration of Application Statistics Summarizer – Follow the same steps mentioned above to change the configuration. Component Status Summarizer allows to set threshold for each SCCM components. There are two (2) types of thresholds and those are Warning threshold and Critical threshold. We have options to disable SCCM status summarization for component status. Also there are options to set the component status replication priority to parent site. To change the configuration of Component Status Summarizer – Follow the same steps mentioned above to change the configuration. Site System Status Summarizer gives an ability to disable the status summarization for site system status. This gives an option to set replication priority of site system status to parent site in your SCCM hierarchy. This also gives an option to set status summarization schedule. But I have never used this option. Site System summarizer threshold gives an option to specify the free space for displaying warning or critical icons in the site system. 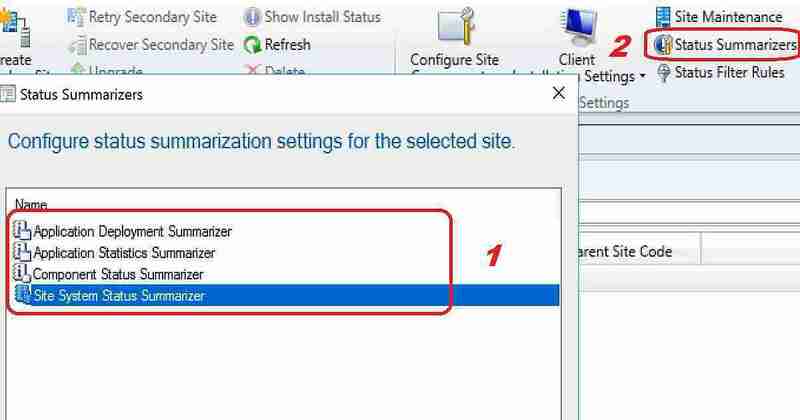 To change the configuration of Site System Status Summarizer – Follow the same steps mentioned above to change configuration. Reset the count of site and component status summarizer count is achieved from SCCM console monitoring workspace. This will help to eliminate some red alerts from your SCCM monitoring console. How to Reset the SCCM Critical Site Status Summarizer counters? As you can see in the video tutorial, click Refresh button to make RED alerts to GREEN. How to Reset the SCCM Critical Component Status Summarizer counters?